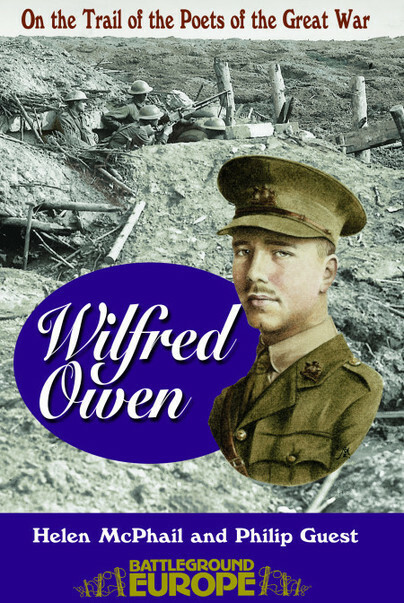 You'll be £10.99 closer to your next £10.00 credit when you purchase Wilfred Owen. What's this? This is a guide to the battlefields that inspired the young and sensitive poet, whose poems are probably the twentieth century's best-known literary expressions of experience of war. Detailed maps, military diaries, photographs and modern roads guide the visitor through the battlefields. Owen's letters are used extensively, together with his poetry, linking specific places events, vividly describing the suffering of the trench. This Poems, letters, and other writings of Wilfred Owen, probably the most well-remembered poet of WW1. This is poignant and thought-provoking. Guaranteed to leave you with tears in your eyes. A comprehensive guide to Wilfred's service with his battalion, the 2nd Manchesters. A battlefield visitor or armchair traveller will be able to follow Owen's military service and travels in the U.K and through France up to his sad death seven days before the Great War ended. Anyone who enjoys the poetry of Wilfred Owen and planning a trip to Northern France to visit his grave will find this book of interest. Well laid out it is made easy for the reader to follow in his footsteps, where it is still possible. Very informative and good read.